The very first design off the drawing boards of William Stanier's team after his appointment to the LMS was this short-bodied type. Based on an earlier wooden panelled Midland Railway type, these steel-skinned 6-wheelers were meant for newspaper and parcels traffic, which often went attached to passenger trains. Their short length allowed them to go into goods docks, loading bays and sheds that larger Express Luggage Vans would not fit into. Guard's seating and valuables locker are grouped around the centrally-located hand brake. Four pairs of double luggage doors allow large barrow-loads to be handled, and fixed shelves at each end were available for perishables such as eggs or pastries which were often carried in rural areas. During the second world war these vehicles were fitted with a pot-bellied stove to keep guards warm in the event of long delays caused by air raids, and when these vehicles were used on parcels trains, work with goods engines not fitted with train heating apparatus. Our example, 2886, was first purchased for preservation in 1970 and based in Devon. It moved to the SVR in 1971 and ran in services in the early years as 32919, until withdrawn for panel repairs which were never completed. 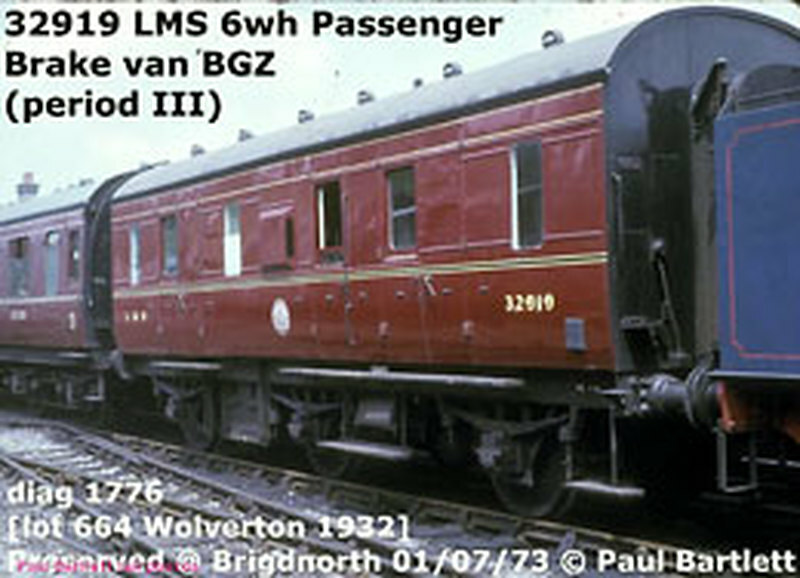 Sold again in 2002 to Steve Downs, a volunteer carriage restorer, 2886 moved to Bridgnorth, just as the LMS&BR Coach Fund was considering joining the Rolling Stock Trust charity. In 2008, 2886 was taken over by the Trust with the intention of being restored back to original running condition and appearance.